Ancient trees native to both Asia and North and Central America, magnolias are typically grown for their attractive form and foliage, bright colored fruits and beautiful, often fragrant flowers. Magnolias are generally untroubled by pests and most plant diseases. Best known of all magnolias is Magnolia grandiflora or Southern magnolia, native throughout the South and beloved for its large elegant flowers, glossy evergreen foliage and graceful form--now the most widely grown ornamental evergreen tree in the world. At least one cultivar is included among fast-growing magnolia trees. Fossil remains of magnolia trees date back 36 million to 58 million years ago. Today’s odd geographic distribution of species can be traced to Ice Age glaciers that destroyed ancient European forests but spared those in Asia and the Americas. Magnolias are primitive flowering plants. What appear to be magnolia flower petals are actually petal-like bracts that surround tiny flowers. Magnolias attract pollinating beetles with sweet secretions. Bees and most other flying pollinators didn’t yet exist when magnolias evolved. Rich, moist yet well-drained soils will help encourage rapid, healthy growth. Most magnolias also do best in full sun, though some will tolerate partial shade. 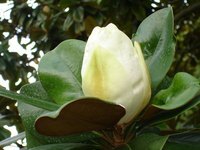 Southern magnolia is most adaptable, growing even in wet and clay soils. Though it thrives in moist or wet soils, Southern magnolia is also considered very drought tolerant when grown in areas that allow extensive root growth, and moderately drought tolerant in poor soil or where roots are restricted. The fast-growing magnolia suitable for a shade tree is Magnolia acuminata, also known as cucumbertree or cucumber magnolia after its cucumber-shaped fruit. The cucumber magnolia grows 60 to 80 feet tall and 30 feet wide, though its flowers are quite small. A cultivar of the famed Magnolia grandiflora or Southern magnolia, Samuel Sommer, is vigorous and fast growing. Samuel Sommer grows to a height of 40 or more feet and up to 30 feet wide, producing flowers as big as dinner plates--up to 14 inches across. Often used as a patio or specimen tree, the Sweetbay magnolia or Magnolia virginiana is known for its very fragrant flowers. One fast-growing cultivar, Willowleaf Bay, is a pyramid-shaped tree with narrower leaves than most Sweetbays. The magnolia cultivar Galaxy, noted for fragrant, reddish-purple blooms that are 8 to 10 inches across, is tall and narrow in its younger years, growing to 20 feet tall in 10 years. It will eventually grow 30 to 40 feet tall and 20 to 25 feet across. The hybrid magnolia Todd Gresham is a fast-growing deciduous magnolia named for its Santa Cruz, California plant breeder D. Todd Gresham. Flowers are tulip-shaped and 10 inches wide, red-purple on the outside and white on the inside. The umbrella magnolia or Magnolia tripetala is a small to medium sized multi-stemmed deciduous magnolia often found growing in the shade of eastern North American hardwood forests. Leaves up to 20 inches long and 10 inches across emerge before foul-smelling 8-inch flowers.